Back to Back Tropical Storms in the Arabian sea – Special Coverage! Cyclone hits Karachi, India – War with Ghazi deepens! Monsoon 2011 and Cyclones – Sub-continent’s coastal threat? Super cyclones – The future of the Arabian sea!! Hypercanes – Can they happen? The Bhola cyclone – Not so “Bhola” at all! Cyclone Yemyin – The untold story! Is Arabian sea getting ready to give birth to “Tropical storm 2A”? Depression ARB 04 is the ninth tropical depression of the 2011 North Indian ocean cyclone season and the fourth depression from the Arabian sea while also the fourth tropical storm from the Arabian sea. On November 23, a low pressure over south-west Bay of Bengal was detected at 1008 mbar and the next day it intensified and showed improved convection. On November 25, it intensified into a well-marked low pressure at 1006 mbar and due to favourable sea temperatures. The next day, the system was declared a tropical storm 04A and a Depression ARB 04 at a pressure of 1002 mbar near Maldives and southern India, during the same day it caused torrential rainfall in Srilanka that killed some 20 people in the country. On November 27, the depression slightly moved in a NW direction. ARB 04 near peak intensity on November 29, weak eye could also be seen! Pakistan Weather Portal (PWP) estimates that ARB 04 is likely to intensify further into a deep depression on November 27 late/November 28 (Happened) and it may further intensify into a cyclonic storm on November 28 depending upon the conditions (Did not happen) surrounding the system (sea temperature in the eastern Arabian sea around 28°C – 30°C) at peak intensity of atleast 55 – 60 mph, it is not forecasted to intensify beyond that stage and weaken gradually from that point due to intense vertical wind shear in the north-western parts that would tear the system apart and cause the pressure to rise; and cool sea temperatures in the western sector of the Arabian sea also likely to hamper further intensification (Happened). Thane – Name from Burma, meaning ‘feudal lord’. This is the final update regarding this tropical system! Yesterday’s depression ARB 04 has further weakened into a well-marked low pressure over northern and adjoining westcentral Arabian sea. It is expected to dissipate near Pakistani coast in 24 to 36 hours as the low is moving in a N/NE direction. The remaining clouds are passing from Makran to Sindh coast and south-eastern Sindh. Mid-latitude trough has also absorbed its moisture; 35 – 40 knots winds and cold water were responsible for rapid weakening of the tropical storm. It is not a significant storm now. Mostly cloudy conditions expected in Pakistani coast with chance of drizzle till night in these areas. This is also the Night time update! Mostly cloudy weather expected in Sindh coast from November 29 with chances of drizzle along the Pakistani coast on November 30, with windy condition. Spiral bands of ARB 04 are now over Balochistan extending to Islamabad and adjoining extreme northern Oman. Clouds from ARB 04 have covered south-eastern Sindh including Karachi. Weak thundercloud SE of Karachi and south of Keti bandar, lying over Arabian sea. However there is no direct affect to any country that is near this storm. Mostly cloudy weather expected in Sindh coast from November 29 with chances of drizzle on November 30. Mostly cloudy weather expected in Sindh coast from tonight with chances of drizzle on November 30. Since the system is moving westwards the rainfall activity would decrease by tomorrow morning in Lakshadweep however isolated showers might continue. Heavy rainfall with strong gusty winds expected in Maldives especially the Lakshadweep Islands where one to two series of heavy rainfall is expected till night with decrease afterwards as system moves in open sea waters. Significant rainfall has occurred in the south-western coast of India, ranging from 80 mm – 160 mm. 2003: November 12 – A category-1 hurricane with winds up to 85 mph, it dissipated near the horn of Africa. 2004: November 2 – A tropical storm (Deep depression) moved and dissipated near the coast of Africa. 2004: November 29 – Cyclone Agni, a category-1 hurricane, it became the nearest a tropical cyclone that has ever approached to the equator. It hit Somalia, it had winds up to 75 mph. 2009: November 4 – Cyclone Phyan, a tropical storm, it created panic in Mumbai. It had winds up to 60 mph. 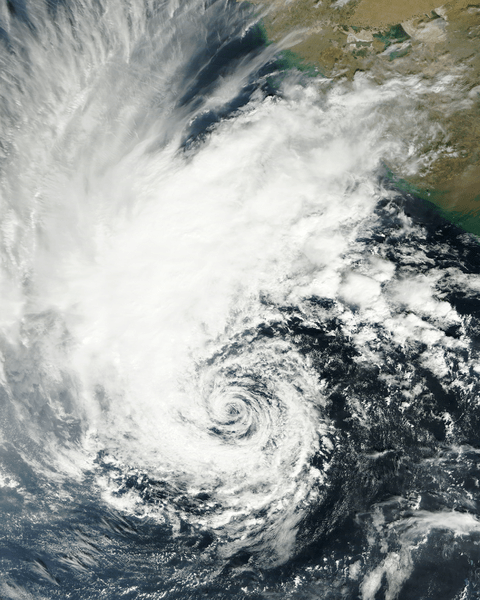 2011: November 1 – Cyclone Keila formed over western Arabian sea and brought unusual flooding rainfall to Oman. Tropical Storm 04A: Your thoughts! Beware of Cyclone Keila – Special Coverage! Karachi is forecasted to get 60 mm in a day wen the cyclone nears the coast. But it dies out in sea.